Christmas came early for Derrick Morton, Journeyman machinist at Quick Turn Precision Machining in Ogden, Utah. Derrick has been working for Quick Turn for the past 5 years, and he has seen the parts being manufactured at the shop getting increasingly more complex year after year. The co-owners were waiting for a specific job that would easily justify the purchase of the Integrex 5 axis (4+1) machine for their business. In the end, there wasn’t a specific job; rather a number of complex jobs that the company was machining on 4-axis machines that would be machined so much more efficiently on a 5 axis machine, that made the brothers pull the trigger. 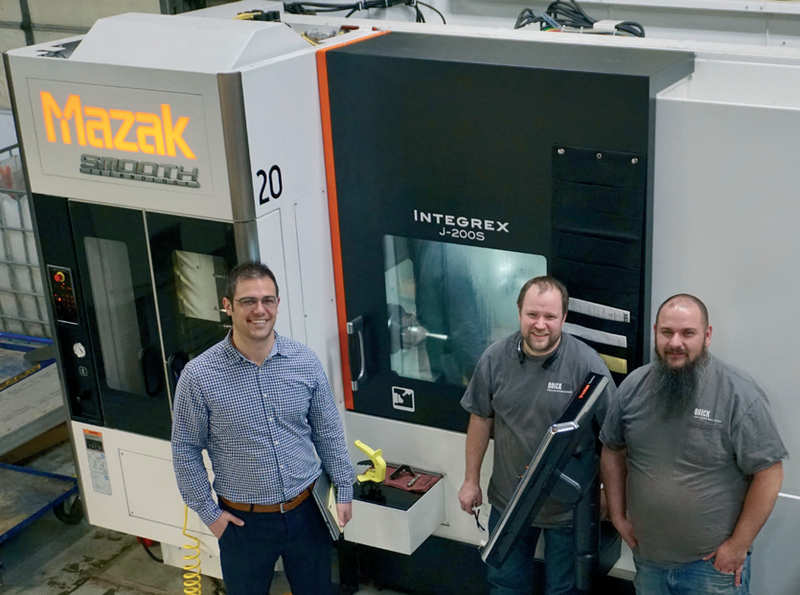 In late November, Quick Turn took possession of their first 5 axis-machining center, a Mazak Integrex J-200S. This Multi-Tasking machine makes use of two turning spindles and a milling spindle (large true Y-axis design), and it also offers automatic tool changing. The main spindle chuck size is 8” with the main spindle speed being 5000 rpm. The milling spindle is a single spindle turret with an automatic tool changer system. The milling spindle speed is 12,000 rpm. money to produce them.” Today, Derrick sets up the Integrex J 200S, and is able to machine parts on one of the Mazak Quick Turn Nexus machines simultaneously. Derrick says it would be nice to get another Integrex. Quick Turn Precision Machining is a full service machine shop specializing in small to medium rapid turn-around precision machine work—from custom tooling and intricate molds to small specialized parts. In addition to state-of-the-art CNC milling, turning and water-jet cutting, Quick Turn Precision Machining also provides heat-treating, sandblasting, welding, fabrication, and technical drawing to meet all your needs. Nate Woods and his brother Adam Woods founded Quick Turn Precision Machining in 1997. The two love to make things—and make them well—and it shows in every facet of their business. Nate continues to direct and lead the company, and the experience and education of building Quick Turn has only increased his love for his trade, and the team he has put together. We have so many in-house capabilities, including milling, turning, waterjet cutting, welding, heat treating and finishing. We are able to offer complete assembly for our customers. And last and most recent, we have our new Mazak Integrex 5 axis J-200S. Nate and Adam are Journeyman machinists, and between the two, they have more than a half-century of experience in the industry. Brother Whit took a different path in his career – he is a degreed mechanical engineer, and he has worked for large companies in several industries, including aerospace, medical, and commercial. Whit is author or co-author to 5 patents, and he helped design components on the B2 Stealth bomber. Nate and Adam merged Whit’s engineering consulting firm into Quick Turn Precision Machining, and today, you can take a product concept (on a napkin), and bring it all the way to production, at the company. Why Smith Machinery and Mazak? Adam and Nate agree that Smith has been an outstanding supplier and partner for them over their years in business. When they first opened for business, 2 young men armed with a strong work ethic and superior mechanical aptitude, their budget only permitted entrée level Fryer machines. 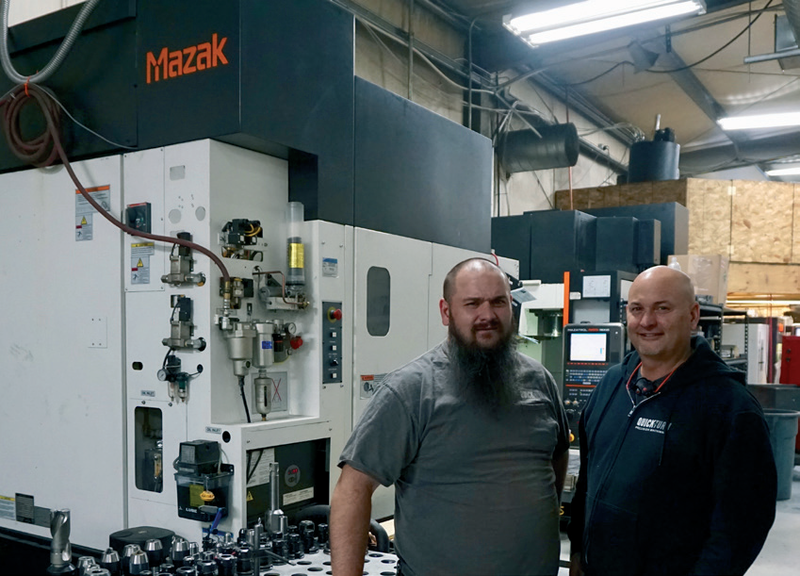 As business grew, and the complexity of the parts increased exponentially, the brothers made the decision to upgrade to Mazak machines through Smith Machinery. Today, they have a dozen Mazak machines in the shop.